The Estes Park California King Bedroom Group by Broyhill Furniture at AHFA in the area. Product availability may vary. Contact us for the most current availability on this product. Drawer Suspension Drawers feature full extension side guides. 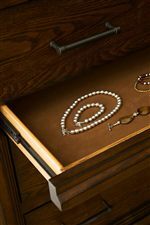 Drawer/Shelf Construction Select drawers feature cedar bottoms for extra clothing protection and aromatic appeal. Finish & Paint Options Collection is available in a dark artisan Brown Oak finish. Case Details Splayed and tapered legs used throughout collection. Handles & Hardware Antique Pewter bar pulls on drawers. Case Construction Constructed of oak veneers. 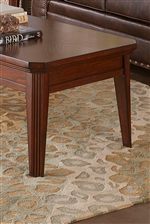 Crafted from hardwood solids and oak veneers, the Estes Park collection offers sturdy construction and a simple style that brings a rustic allure to your home. 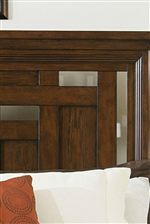 Splayed legs, crown moldings, and clipped corners create a relaxed-yet-sophisticated look, while the dark artisan Brown Oak finish envelops any home in rich, warm tones. Ample storage defines the collection, as most pieces offer multiple drawers or doors for helping you stay organized, with special features like hidden drawers and felt-lined jewelry trays for extra protection. A choice of two bed styles lets you create the bedroom retreat you've always wanted, whether you like the updated feel of the pierced detailing on the panel bed or the mission style of the slat poster bed. Revel in the simple silhouettes, handsome craftsmanship, and practical storage of the Estes Park collection and bring a warm, relaxed look to your living room, dining room and bedroom. The Estes Park collection is a great option if you are looking for Casual furniture in the area. Browse other items in the Estes Park collection from AHFA in the area.